Most Americans -- 52 percent -- disapprove of the Graham-Cassidy health care bill, according to a CBS News Poll conducted between Sept. 21 and 24. Only 20 percent of those polled said they approved of the Republican legislation aimed at repealing and replacing the Affordable Care Act signed into law by President Obama. Overall, more than a quarter of those surveyed by CBS News declined to give an opinion of the GOP bill, but those who did express an opinion said they disapproved by more than two to one. 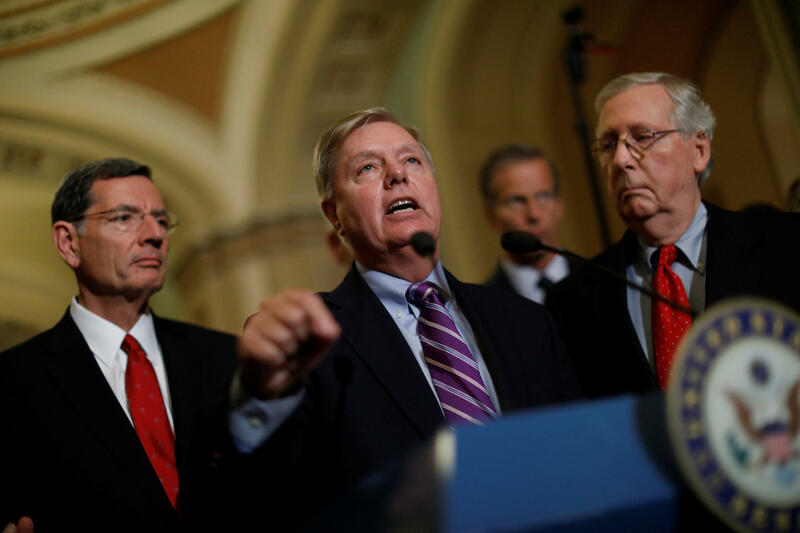 Fewer than half (46 percent) of Republicans said they approved of the Graham-Cassidy bill, which is expected to come up for a vote in Congress on Wednesday. Only 18 percent of independents approved, and just two percent of Democrats gave it their backing. Those who said they disapproved of the Republican's second attempt to repeal and replace the legislation known as "Obamacare" tended to say they "strongly" disapprove. Even among the Republicans who said they approved of the bill, more describe themselves as being "somewhat" approving than "strongly" approving. A plurality of Americans says Republicans in Congress are moving too fast to try to pass the bill. Many Americans -- 42 percent of those polled -- said they thought Republicans were moving too fast to try and pass the Graham-Cassidy bill, including an overwhelming majority of Democrats and 39 percent of independents. Forty percent of Republican respondents, however, said they feel the effort is moving too slowly. Of the 32 percent of people polled who said they believed the bill would impact them personally, most -- 25 percent -- said they thought it would hurt them. Only seven percent of Americans think the bill would help them personally. Half of Americans, and six in ten Republicans, said they didn't believe the bill would impact them either way. Seventeen percent said they didn't know how the proposed legislation would impact them. One area of strong partisan agreement revealed by the CBS News poll was on health insurance for people with pre-existing conditions. Nearly nine in ten Americans -- including large majorities of Republicans, Democrats, and independents -- said they believe health insurance companies should be required to provide insurance to people with pre-existing conditions. Most people want the Affordable Care Act to be improved, not repealed. Three in four said the law should either be kept in place (9 percent) or that it has some good things in it but needs some changes (65 percent). One in four said it has so much wrong with it that it should be repealed and replaced entirely. Nearly half of Republicans were of this view, indicating partisan divisions still run deep on this issue. However, about as many Republicans said there were some good things in the law and only changes are needed. Most people said they placed a higher priority on health care than tax reform as an issue for Congress and the president to tackle. Overall, 74 percent prioritized health care policy, and only 23 percent tax reform. The desire for tax reform was greater among Republicans and independents, but even among these groups, the majority prioritized health care policy. This poll was conducted by telephone September 21-24, 2017 among a random sample of 1,202 adults nationwide. Data collection was conducted on behalf of CBS News by SSRS of Glen Mills, PA. Phone numbers were dialed from samples of both standard land-line and cell phones. The poll employed a random digit dial methodology. For the landline sample, a respondent was randomly selected from all adults in the household. For the cell sample, interviews were conducted with the person who answered the phone. Interviews were conducted in English and Spanish using live interviewers. The data have been weighted to reflect U.S. Census figures on demographic variables. The sample included additional interviews conducted with African Americans, who had previously completed a survey as part of a random sample. The combined African American and non-African American samples were weighted separately to match their group's population characteristics such as gender, age, education, region, marital status and phone use based on recent U.S. Census estimates. The samples were then combined and weighted to the total U.S. adult population.